The system for MBBS in USA is absolutely different than the one followed by most of the European (MBBS in Russia / MBBS in Ukraine etc.) and Asian countries (MBBS in China / MBBS in Nepal etc.). The doctors earn US$ 3,500 during residency in USA (4 Years) making the total cost of the program as ZERO! There are no capitation fees for PG while in India, it touches more than Rs. 2 Cr or other PG programs are not approved in India. In USA in order to practice, you have to complete your board certified residency (Equivalent to PG in India) and just Bachelor level MBBS is not sufficient. Accordingly, if you just complete bachelor level, you would have to give the MCI screening test in India. However, no one returns back at Bachelor level since the reason to go to USA is PG. 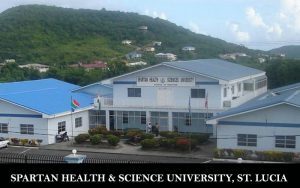 Accordingly, the first 3 years need to be spent at St Lucia and from there onwards, you move to USA under study visa at the hospitals affiliated with the University. Every student is prepared for MCQ based USMLE-1 during this 3 years program and the board conducts exam for them at the end of their first 3 years. This is the main competitive exam for the students. Generally Indian students are able to crack this due to their educational skills gathered in India. The next 2 years are to be Clinical rotation in USA covered in the Greenbook. 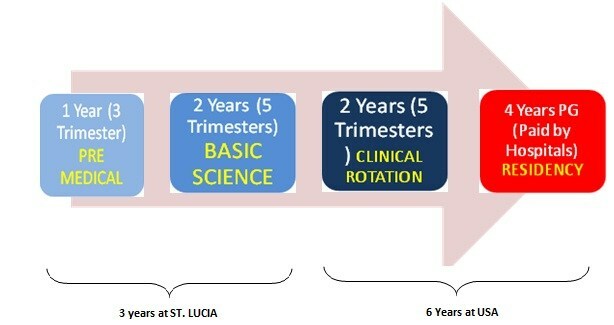 You have an option to do first year Core rotation of 48 weeks) at Jamaica / St Lucia / India (Hyderabad at Medcity Hospital – for lower cost) and the last year (Elective rotation consisting of 28 weeks + 4 weeks of mandatory rotation in Neuro department). At the end of the clinical rotation, the students need to give USMLE 2 CK (Clinical Knowledge – written exam) and 2CS (Clinical Skills – Oral) and they proceed to the Residency at an ACGME approved hospital. You start earning around US$ 3,500 as stipend for the next 4 years which takes care of all your living cost + gives back the money that you spent during the Bachelor program. This is the best part of doing Medical program in USA. That is why we recommend this above all the other programs. YOUR NET COST OF STUDYING UP TO MEDICAL – PG PROGRAM IN USA ZERO! Few universities claim to have accreditations such as CAAM-HP (A very important aspect) but countable universities have this kind of approvals. Listing on FAIMER, Approval by USMLE and list of hospitals in collaboration with the university for conducting the clinical rotation is the most important thing to be considered. So do not just go by the cost of study – go technically sound and for the most value for money university. DOLPHIN EDUCATION would help you select the right one and help you compare all the universities for your admission to MBBS in USA programs. For MBBS in USA, it is not only the USMLE approved and listed college degree which is important but also the exams conducted by the USMLE which decides the successful roadmap of the student. At the first step of USMLE-1 – the minimum passing marks are 192 while the average score for around 65,000 students in 2014 was 229. Generally, the students scoring above 250 marks easily make it to the residency in USA. You can give the exam again in order to improve your score and DOLPHIN EDU can place you as a teacher in the same university or other islands after completion of bachelor to ensure your entry to the Residency program later. The average salary for the teacher is also no less than Rs. 18 Lac per annum which is fare better than the average income of a fresh doctor in India. The number of students appearing for USMLE-1 is around 65,000 compared to the residency seats of 35,000. Accordingly, the chances of getting through the residency are more than 50%. In short, on average, every student makes it to the residency in the second attempt at the most. Just compare this with the number of doctors passing every year in India to be around 35,000 in compared to the PG Medical seats across the country in government colleges are only 1,200! The chances of getting through PG medical seat in India are lesser than 3%! 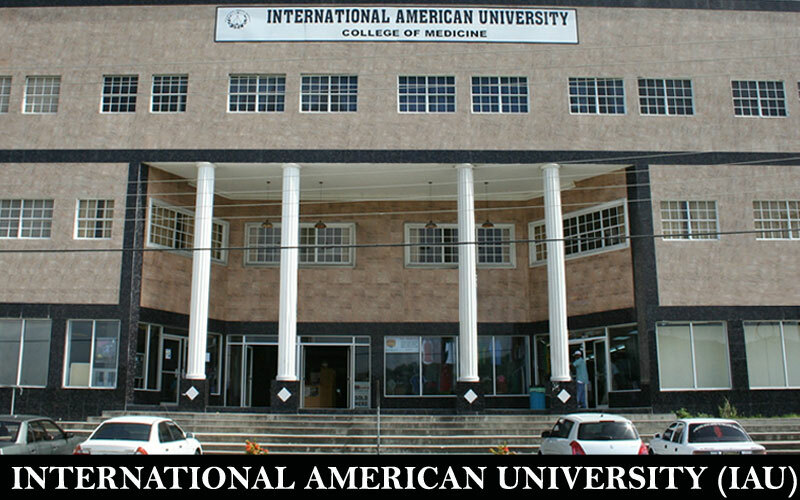 Indian students having lower academic such as 60% in PCB and wishing to go for high quality and lower cost MBBS in USA programs choose this university. Higher are your marks, higher Scholarships could be applied for you. Even students with 50% in PCB group may apply and secure the admission here through DOLPHIN EDU without any Scholarship. DOLPHIN EDU has been placing Indian students for MBBS in USA in general & at IAU as its Non – exclusive representative for the last 2 years. All these students understood the difficulty level of getting into Indian government medical college while ease of complete roadmap in USA and applied through DOLPHIN EDU for MBBS in USA. In order to guarantee your place for MBBS in USA programs, you shall really have to time your application perfectly. The ideal time to apply is always before 30th July (with Scholarship) every year in Spartan and latest by 30th August (Without guarantee for Scholarship). One must apply in time so that the seats could be allotted to you. Also, the cost of airfare becomes extremely high if you buy it near to your departure date. 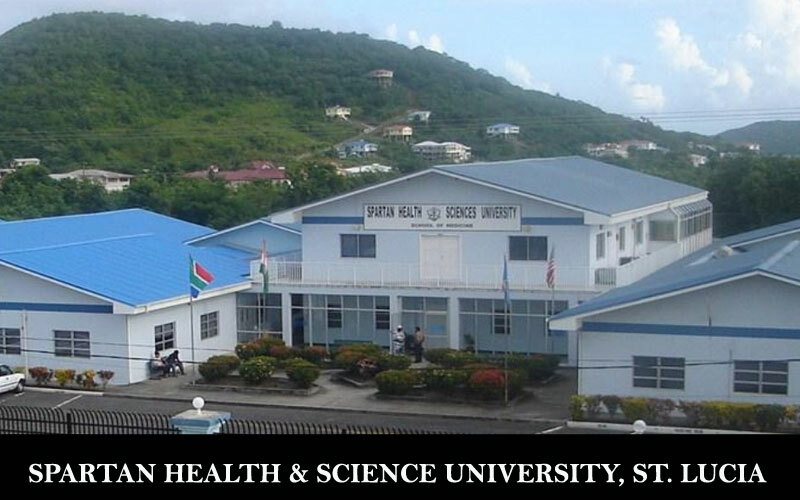 This is the oldest available university since last 35 years on the most beautiful islands and has the highest accreditations including CAAM-HP (which very few universities have). The success ratio for the residency from Spartan is more than 65% in the first attempt of USMLE 1 itself and the average time period to reach the residency is 5.5 years for all the students compared with other MBBS Universities in USA who have an average of around 7.5 years!The current affiliation within USA is at Atlanta Medical Center, Chicago which is considered to be one of the finest 2 years internships (Clinical Rotation) possible within USA. The university supports a high quality education for USMLE 1 preparation as well as smooth transition for US based hospitals for clinical rotation and Residency. 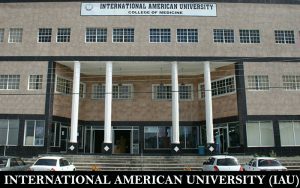 DOLPHIN EDU has been placing Indian students for MBBS in USA in general & at IAU as its exclusive representative for the last 2 years. All these students understood the difficulty level of getting into Indian government medical college while ease of complete roadmap in USA and applied through DOLPHIN EDU for MBBS in USA.